Peanuts is a syndicated daily and Sunday comic strip written and illustrated by Charles M. Schulz, which ran from October 2, 1950, to February 13, 2000, continuing in reruns afterward. The strip is the most popular and influential in the history of comic strips, with 17,897 strips published in all, making it "arguably the longest story ever told by one human being". At its peak, Peanuts ran in over 2,600 newspapers, with a readership of 355 million in 75 countries, and was translated into 21 languages. It helped to cement the four-panel gag strip as the standard in the United States, and together with its merchandise earned Schulz more than $1 billion. Reprints of the strip are still syndicated and run in almost every U.S. newspaper. Peanuts achieved considerable success with its television specials, several of which, including A Charlie Brown Christmas and It's the Great Pumpkin, Charlie Brown, won or were nominated for Emmy Awards. The holiday specials remain popular and are currently broadcast on ABC in the United States during the corresponding seasons. The Peanuts franchise met acclaim in theatre, with the stage musical You're a Good Man, Charlie Brown being a successful and often-performed production. Peanuts has been described as "the most shining example of the American success story in the comic strip field"; this is ironic, given its theme is "the great American unsuccess story." The main character, Charlie Brown, is meek, nervous, and lacks self-confidence. He is unable to fly a kite, win a baseball game, or kick a football. On the surface, the concept of Peanuts seems simple and with little difference from most comic strips:it consists of a short series of events, followed by a joke or gag; however, at least on its 1960s peak, it surpasses most comic strips in that it is sharp, intellectual, emotionally real, and can be read on several levels of enjoyment. 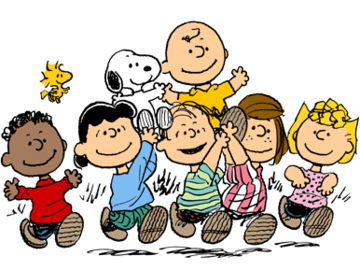 In 2013, TV Guide ranked the Peanuts television specials the fourth greatest TV cartoon of all time. A computer-animated feature film based on the strip, The Peanuts Movie, will be released on November 6, 2015. In 2010, the Iconix Brand Group aquired most of the Peanuts assets and formed the new company Peanuts Worldwide.